Bipolar anxiety is a symptom of bipolar disorder ? one of a number of health conditions with the power to severely impact your life. Bipolar disorder and bipolar anxiety can be detrimental to a your mental and/or physical well-being if not managed properly. While everyone living with bipolar anxiety experiences emotions differently, there are certain symptoms associated with bipolar anxiety that can make everyday life difficult. As such, it’s important to familiarize yourself with the signs and symptoms of bipolar anxiety in order to come up with a proper diagnosis. Many people experience changes in their mood or level of anxiety. People with bipolar anxiety, though, may experience drastic changes resulting in intense mood swings, which can hinder their relationships and other aspects of their daily lives. If you experience bipolar anxiety, you may have bipolar disorder or anxiety disorder. This is not uncommon, and there are ways to treat these conditions both together and separately. Bipolar disorder is a brain disorder that can cause various shifts in a person’s mood, which may negatively impact their abilities to function. Also described as manic-depressive illness, the disorder can result in severe emotional issues, including depression and bipolar anxiety. Mood swings caused by the disorder can persist for weeks or longer and can include dramatic episodes in which the person is irritable, sad, hopeless or even overly high. Mood changes can result in severe behavior changes that can recur over time. These periods of emotional highs and lows are described as mania and depression and can occur suddenly, alongside normal behavior. Manic episodes are diagnosed when an elevated mood is accompanied by three or more primary symptoms for most of the day, mostly every day, for a minimum of one week. If an irritable mood is present, then you must experience four additional symptoms to be diagnosed. Depressive episodes are diagnosed if at least five primary depressive symptoms are present for most of the day, mostly every day, for a consistent period of two weeks or more. What Are the Symptoms of Bipolar Disorder and Bipolar Anxiety? Anxious distress — feelings of tenseness or restlessness, trouble concentrating due to worry, fear of impending doom, or a feeling of loss of control. Bipolar I disorder. You’ve experienced a minimum of one manic episode, which may be preceded by or followed by a hypomanic or major depressive episode. Mania symptoms may result in significant impairment and may require hospitalization. Bipolar II disorder. You’ve experienced a minimum of one major depressive episode that lasted for at least two weeks as well as a minimum of one hypomanic episode that lasted four days or longer, but you’ve never experienced a manic episode. These depressive episodes or mood swings can result in distress in areas of your everyday life. Cyclothymic disorder. You’ve experienced a minimum of two years—or one year for children and teenagers — of numerous instances of hypomania symptoms and instances of depressive symptoms. During this time, symptoms occur at a minimum of half the time and don’t cease for longer than two months. Symptoms can cause significant distress. How Can I Manage my Bipolar Disorder and Bipolar Anxiety? If you are like one of the millions currently living with bipolar anxiety, you may be seeking a new method of management. Seeking a prompt diagnosis is important if you are experiencing symptoms of bipolar disorder or anxiety. There are a variety of methods that may be helpful in alleviating the symptoms associated with bipolar anxiety. These can include cognitive behavioral therapy or natural methods that, when used with a healthy diet and exercise plan, can improve your state of mind. 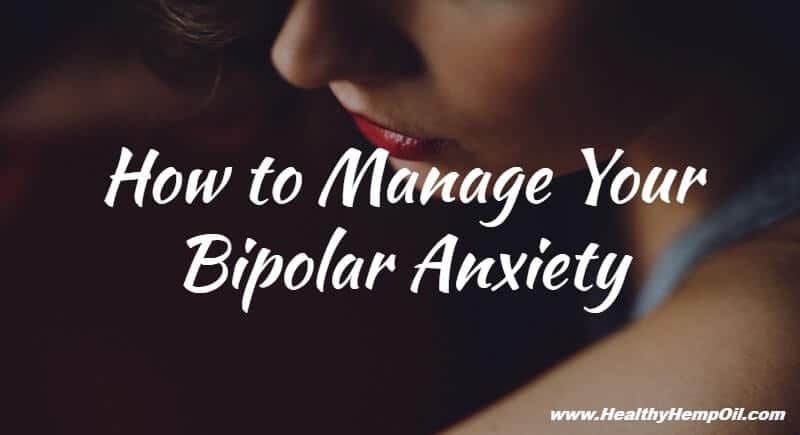 Finding an effective form of management for your bipolar disorder is important for relieving anxiety and maintaining good quality of life. Experiment with different methods with the help of a professional to find the right method of management for you. Which methods do you find most effective in coping with your bipolar anxiety?